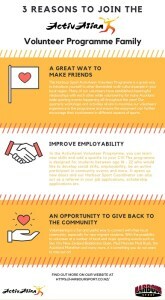 The ActivAsian Volunteer Programme aims to provide young people with the opportunity to volunteer at a number of local and major sporting events throughout the year. This programme is designed for students between age 16 – 22 who would like to develop social skills, employability, be an active participant in community events and more. This programme is especially suitable for new migrant students as volunteering is a fun and useful way to connect with their local community.